Here comes Valentine's Day. Each year we look forward to a party with our fellow homeschoolers. This year, we're making it a Valentine's school day with special crafts and activities. 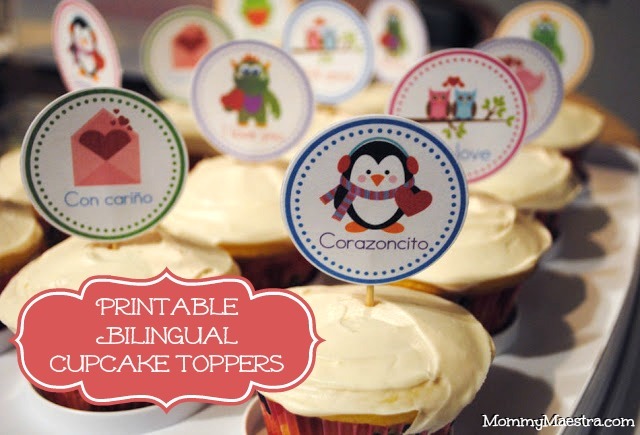 I want to remind you that if you happen to be in charge of providing cupcakes for a party or school day, don't forget that I have this free printable I created for making your own Bilingual Valentine's Mobile and Cupcake Toppers. They are super cute and easy to print and cut out. Then just glue the matching toppers together (English on one side, Spanish on the other) with a toothpick sticking out the bottom and you're done! My kids love to assemble the cake toppers. There's actually a few printables for Valentine's Day that you can find there in my TpT store. Enjoy!